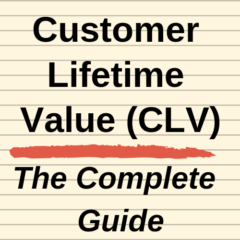 Please note that there is also another example in the article explaining the customer lifetime value formula. In this example, the calculations have been summarized from a spreadsheet on a step-by-step basis. Please refer to the free Excel CLV templates on this site. Each of the numbers will be discussed below, but the key number – customer lifetime value – has been shown in the bottom right yellow cell and is equal to $583. The first row simply shows acquisition costs per customer. In this case the firm has determined that their overall promotional, sales and set-up costs per customer is equal to this amount. You should note that this expenditure/marketing investment has been incurred in year zero. This is because there is a lag time between promotional campaigns and the generation of first-time customers. Therefore, acquisition costs typically set in year zero with revenues coming on-stream the following year. The next two rows show the average per customer revenue and the average costs incurred by the organization to obtain that revenue – resulting in the fourth row, which is the difference between those two and is the average profit contribution per active customer. It is important to note that these three rows show revenues, costs and profit contribution for current/active customers only. That is, for continuing/existing customers. It is further down in the calculation that considers the retention/churn rate of customers. As you can then see, the fifth row of numbers (retention rate) reduces by a factor of 25% each year. In the first year, we assume that all first-time customers have purchased from the firm – which they would need to in order to be considered customers. In the second year, we have retained 75% of those, and in the third year we have retained 75% of the 75% (which is equal to 56% of customers). Even with a relatively high retention rate of 75%, by year 6, only around 24% of those customers acquired have remained loyal. 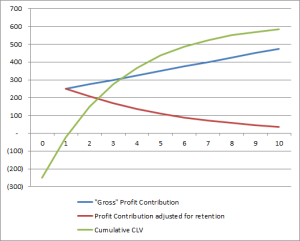 This calculates the following row, which is profit contribution of retained customers. This is calculated by the retention percentage of that year – say in year 6 (of 24%) multiplied by the product contribution received from active customers in that year (which is $375). This works out to be 24% X $375 = $89. In other words, for the customers that have remained loyal, the firm is making $375 in profit contribution – but there are only around a quarter of them who are still existing customers – which means we have to reduce the profit contribution accordingly. 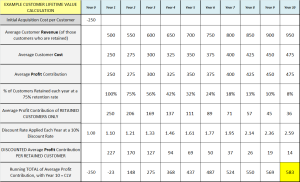 The best way to think about the role of the retention rate in the customer lifetime value calculation is to consider that it estimates the percentage probability of the firm receiving the customer’s revenue in future years. The next row shows the discount rate, which is compound at 10% per annum. The average profit contribution of a retained customer – say $89 in years six – is then divided by the discount rate, in order to adjust to present day value. As year six is a reasonable distance into the future, the customer lifetime value calculation reduces it to $50 (as an equivalent to today’s money for the organization). 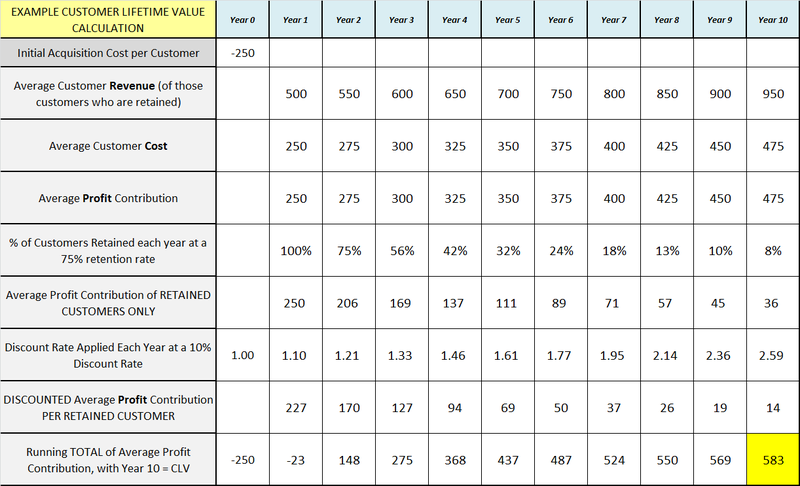 The running total along the bottom row shows the cumulative customer lifetime value over time. As the firm has decided to only consider 10 years of revenue and costs, the end customer lifetime value calculation works out to be $583. Using the example above, let’s graph three rows from the table (see below). The blue line trending upwards is the profit contribution of any active/loyal customers over time. In the example, the company was working to increase revenues during the life the customer. The red line is trending downwards. 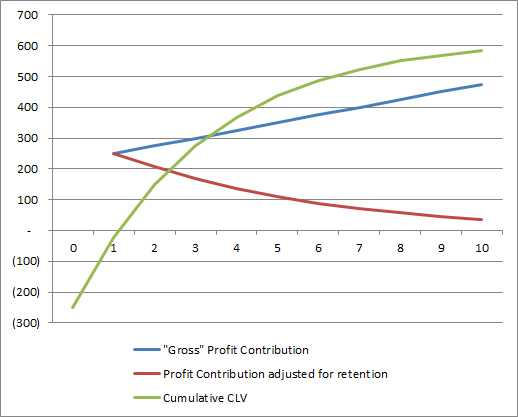 This is the profit contribution per customer (that is, the blue line) adjusted for customer retention rates. Over time, this line will eventually run to zero dollars as all customers will cease to be loyal at some time. The green line is the cumulative customer lifetime value calculation. Eventually the customer lifetime value will flatten, due to the combined effects of churn of customers and the application of a discount rate.